Glu Games’ Super K.O. Boxing 2 is a lively 2D boxing game with comic book-like artwork and soundtrack reminiscent of an 1980’s arcade. Punching out your opponent in the boxing ring can be very satisfying in this particular game, especially after a very frustrating round of dodging and fruitless swinging. Like most fighting games, the objective of Super K.O. Boxing is to defeat all your opponents in order to become Champion of the World. Because this is a boxing game, the fights are broken up into three circuits with eighteen bouts total. With each victory you unlock characters, circuits and challenges. You can even earn free doses of Roid Rage, a drug to be used in emergencies when your opponent is about to knock you out of the ring. If you can’t be bothered to spend time earning Roid Rage, you can purchase them through the game. When you’re in the ring, swipe along the bottom left hand corner to move and dodge around your opponent. Tap on the bottom right hand corner to punch. Although you can use your thumbs to play the game like a traditional handheld, I personally found it something of a challenge. Eventually I rested the iPod touch on my table and used my pointer fingers to play the game. The first round of the game is easy. Your opponent simply stands there and allows you to punch him out. This does not prepare you for the following rounds with an opponent that can actually dodge and punch back. By the time you’re in the second circuit, frustration has you in its grips and you’re fighting the urge to button mash the iPod touch to death. Although you’re still winning – barely – the fights are longer and the opponents more annoying. The desire to keep playing is fueled by the need to end these cheesy boxers you’re pitted against. The graphics are bright and crisp, and the art is colorful and quirky. Listening to the soundtrack made me feel old – but in a good way. My only real issue with Super K.O. Boxing 2 is how previous opponents do not prepare you for the difficulty level of the next bout. Otherwise, it’s a very entertaining boxing game that keeps you playing even when you’re ready to roar from frustration. Note: This app is free for a limited time. AppSafari review of Super K.O. 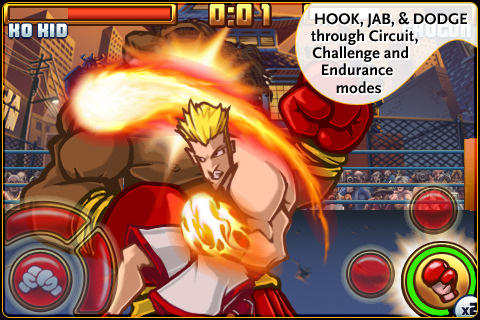 Boxing 2 was written by Julie Guan on February 6th, 2011 and categorized under App Store, Beat-em Up, Fighter, Games. Page viewed 4588 times, 1 so far today. Need help on using these apps? Please read the Help Page.